Vertical reinforced bars – 1.2mm galvanised steel verticals in super strong profiles for increased strength and reduced flex. Metal track holder and door post – An integral metal structure, not just a track and a few pieces of wood! Horizontal reinforced bars – 0.7mm galvanised steel, with a dovetail section for maximum strength and minimu flex. High load runners – Four sealed chrome steel ball bearings for doors up to 80kg, you can even have runners for 120kg doors on request. As well as the metal frame for your pocket door, we supply you with a jamb kit, sometimes called a finishing joinery kit. This is what makes the end product into a beautiful, properly finished sliding door. The jambs are routed so that the brushes we supply neatly close the gap between the door and the pocket frame. Designed by Eclisse to give a perfect finish to the system, we’ve left nothing to chance. Self-centring door guide – The spigot guide is attached to the frame, not to the floor, and automatically centres itself always spot on. Maintenance free track and runners – Our running gear is independently tested to more than 100,000 open/close cycles – that’s more than 30 years average use. Anti-Warp profile – If the door warps, this profile will stay true and the sliding action will stay smooth. Adjustable stops – Fully adjustable doorstops that hold the door in your chosen open and closed positions – ingenious. 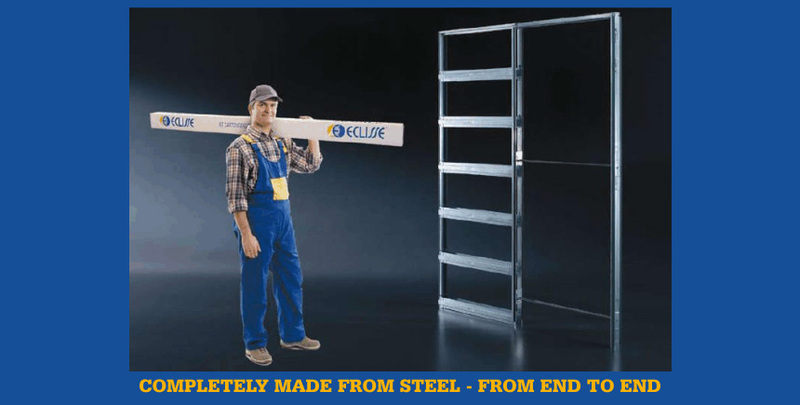 Fully extractable track – In the unlikely event anything did go wrong with your kit, Eclisse have designed a patented system of removing the track without having to break the walls.